A quick mixed media piece for Colour Collective (Mint Cream) and Illustration Friday (squirrel). Haven't done an art challenge for a while. This was fun! 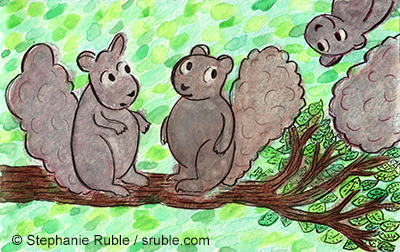 Plus, I couldn't resist painting the squirrels (there's always a third squirrel)! Everyone has a different way they create picture books. I've been working on new picture book ideas lately and decided to outline my process below. 7. decide that I CAN and/or WANT TO draw / write it! Yay! * Research Note: Research includes (but is not limited to), finding information on the subject of the book you're writing, finding out whether or not there are other books on your topic (+ thinking about how yours will be different if there are lots of them, or how yours will introduce topic if there aren't any), and reading mentor picture books. Mentor books are books that are similar to the one you are trying to write, whether it's the subject of the book, the story, the style written, age group, etc. Also, research can and usually does happen again during the writing / drawing stages. ** Dummy Note: Authors can benefit from making simple dummies to see where page turns might fall and whether or not they have enough content for a picture book. You can do this even if you can't draw. You don't even have to include drawings, you can just put the words on the page. Or if you want, you can draw stick figures. These mock ups are for personal use in the writing process and not to send to publishers, unless you're also an illustrator.